Tungsten carbide wedding rings and bands for men are some of the most durable, heavy and solid rings you can buy. They’re stronger than other metals, and are perfect for the man who might give his ring a beating. 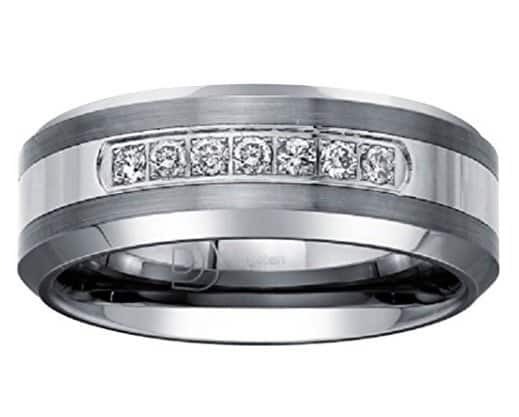 As a symbol of your love, there’s no metal that is stronger or more meaningful than a tungsten wedding band. These are some of the choices that are miles away from plain, old wedding bands. This ring, from the Midnight Yellow Collection, has a brushed metal exterior with a polished inner surface. It’s made of tungsten, which is the world’s strongest metal, and has the added bonus of being hypoallergenic and tarnish-resistant. 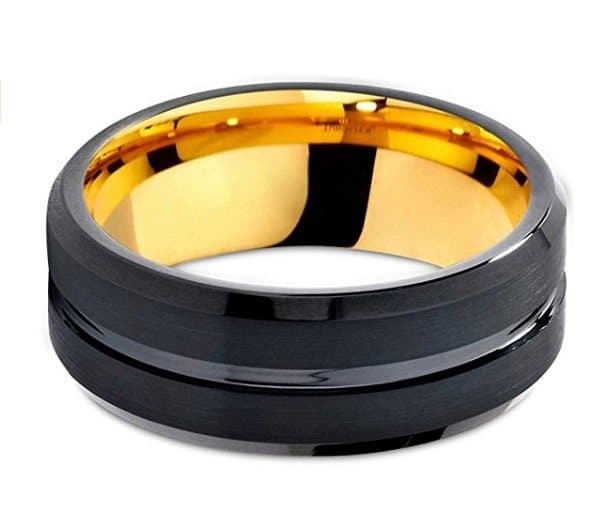 While most tungsten carbide wedding rings come in a classic gray, this ring is a deep, sensual black that will match the passion you have for your new husband. It measures 8 mm and is made of the strongest metal, which means it’s sturdy, while also being very sophisticated. It has a beveled edge and 18k gold on the interior. This isn’t a plain wedding band, and it’s almost guaranteed that nobody else will have a ring as unique as his. 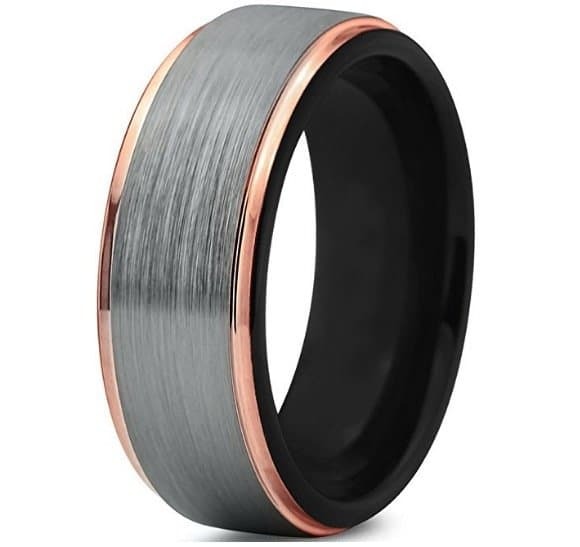 From the Midnight Rose Collection, this tungsten carbide wedding band has a brushed exterior surface with a trim of 18k rose gold on the edges. This beautiful, sophisticated wedding band will allow the brides to get a rose gold wedding set, that will completely match his band. 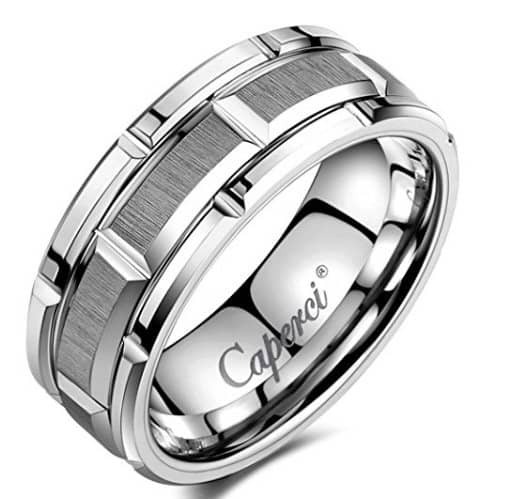 This stunning tungsten carbide wedding band has a smooth inner surface that will feel amazing on his finger. It also won’t tarnish his finger. He can wear it anywhere, and not worry about banging or denting this ring. As a symbol of your love for each other, you don’t want him to remove this ring when he works everyday. You want him to wear it proudly. The brushed exterior is made of tungsten as well as the smooth interior. The edges are 18k rose gold, and the ring measures 8 mm. The black tungsten 900 carbide ring from Sabrina Silver is set with a 0.07 carat white diamond in a bezel setting. It has a scratch-resistant black coating over the tungsten. On the inside, it’s smooth for normal wear, and stamped with ‘Tungsten and Diamond’. The ring is comfort fit with sizes ranging from 8 – 13, with half sizes available. This means that you won’t have to get a size larger for your tungsten carbide wedding band. The ring should fit perfectly. You want a ring that fits perfectly because tungsten rings cannot be sized. They are so strong that trying to cut, or resize the ring will cause issues with fracturing or shattering. This AX Jewelry tungsten wedding band for him has a row of small, natural diamonds running down the stainless steel center. It creates a contrasting line down the center of the ring. The rest of the ring is made of tungsten carbide. There’s a brushed finished outside of the center strip with a smooth finished bevel edge on the outside of the ring. The diamonds are 0.20 carats of natural white diamonds in H-1 and I-2 quality. The width of the ring is 8 mm. It’s a comfort fit ring in a variety of available sizes from 7.5 to 14, which means there’s an option for every man. From Caperci, this last ring has a brick pattern, which is unlike any other ring on this list. It’s made of a combination of brushed and smooth tungsten to create a beautiful pattern on the ring itself. There are three levels of brick pattern with the interior section being made of brushed tungsten and the exterior made of smooth, shiny material. This ring comes in a variety of comfort fit sizes from 8 to 13, which leaves a lot of options for men of different sizes. It has a width of 8 mm, a thickness of 2.3 – 2.5 mm, and a weight of 20 grams. This ring is cobalt free, which means it’s hypoallergenic and shouldn’t cause any adverse reactions for the person wearing it. Tungsten is a scratch-resistant metal that will hold its shine and color throughout the years. If you’re looking for a beautiful, yet durable wedding band for him that he can wear anywhere, the tungsten rings on this list are a must-have. You don’t have to worry about him removing his ring and losing it. They’re scratch-resistant, heavy and strong. He can wear it at work, tinkering with his car, or building a shelf for your new home. It’s a masculine, elegant ring that he’ll love for years, especially after all the compliments he gets.